The Makerere University academic Dr Stella Nyanzi has been released on bail after a four weeks behind bars. The don is facing cybercrime related charges. The Buganda Road Court on Wednesday granted Dr Nyanzi a non-cash bail of $2,857 (Ush10 million), with sureties of similar amount. She is accused of cyber harassment after allegedly referring to President Yoweri Museveni as a "pair of buttocks" on her Facebook post. Dr Nyanzi is being charged under the Computer Misuse Act, 2011. 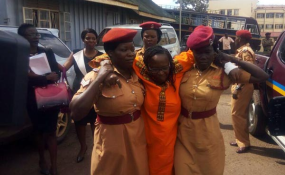 Supported by two female prison wardens, Dr Nyanzi appeared before the court looking frail. Her lawyers said the she was unwell and had collapsed in the morning forcing the prison authorities to take her to hospital before presenting her in court for her bail hearing. "Dr Nyanzi suffers from high blood pressure which paralyses the lower part of her body. Two days ago she suffered an attack and this morning, she collapsed before she was brought to court," a member of her legal team said explaining why her case had been delayed. Magistrate Ereemye Mawanda rejected gagging orders that the State had demanded as condition for her release. Other than the bail, Dr Nyanzi was only required to handover her passport. The Makerere research fellow was arrested on April 7 and first appeared in court on April 10. The State says Dr Nyanzi's reference to the person of the president was offensive. Meanwhile, human rights group Amnesty International has called on the government to drop all charges against Dr Nyanzi saying that case violates Uganda's Constitution. "It is a great relief that Stella Nyanzi is no longer behind bars, as she should never have been arrested in the first place. The government's attempt to prosecute her for speaking out for the rights of Uganda's women and girls, is an affront to freedom of expression" said Sarah Jackson, Amnesty's deputy regional director for East Africa. "The authorities must now let common sense prevail by immediately and unconditionally dropping all the charges against her. The continuation of this farcical case blatantly violates Uganda's constitution, and its regional and international human rights obligations," she added. The next court hearing will he held on May 25.